Mastercraft Avenger GT tires are high performance all-season tires that work well on all types of sport compact and mid size coupes. With its aggressive tread design pavement hugging tread compound, this is a serious performer for smaller vehicles. The tire itself features a solid center rib with notches throughout to go along with shoulder slotting to provide better overall handling in all weather conditions. It also gives the tire more even tread wear which results in a longer lifespan. Ride comfort is enhanced through the Avenger GT’s optimized tread pitch sequence which helps eliminate unwanted road noise. Available in T and S speed ratings, this model is also M+S rated for winter driving conditions. Prices on the Avenger GT tires range from around $95 for the smaller 14 inch series to approximately $165 for the larger 16 inch series tire. Who Are Mastercraft Avenger GT Tires Designed For? Mastercraft has designed the Avenger GT for drivers of sport compacts and mid sized coupes who are looking for an all-season high performance tire that also provides a comfortable ride and good wear. 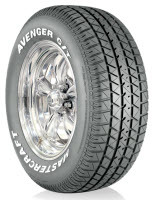 Mastercraft Tires warrants the tread life on the Avenger GT for 50,000 miles. Materials and workmanship are also warranted for 50,000 miles and include free tire replacement for the first 25% of wear, followed by a prorated amount during the remaining period, down to the final 2/32 inch of tread depth. You’ll also find a 45-day road test that allows you to test drive the tires and exchange them for another Mastercraft model is you are not completely satisfied.